A filling is a proedure to restore a tooth damaged by decay back to its normal function and shape. When a dentist gives you a filling, he or she first removes the decayed tooth material, cleans the affected area, and then fills the cleaned out cavity with a filling material. By closing off spaces where bacteria can enter, a filling also helps prevent further decay. Materials used for fillings include gold, porcelain, a composite resin (tooth-colored fillings). If decay or a fracture has damaged a large portion of the tooth, a crown, may be recommended. 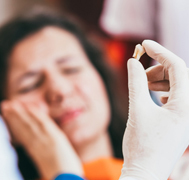 Decay that has reached the nerve may be treated in two ways: through root canal therapy (in which nerve damaged nerve is removed) or through a procedure called pulp capping (which attempts to keep the nerve alive). When Do I Need A Filling? At Bright Smile, we are proud to be one of the best Dental Clinic with utmost care using the advanced technology and we have a team of best Dentists in Dubai to ensure safe and best oral health for our patients. Be it dental extraction / dental removal / dental filling service you can rely on us. So if you would like to consult a dentist for your tooth removal service or tooth extraction and tooth filling services, just call us and meet us to take care of your oral health. Hearing strange noises and having someone work inside your mouth can understandably cause a lot of stress and anxiety. But not to worry, we’re here to tell you exactly what will be going on from start to finish the next time you visit your dentist for a routine checkup. After all, the more you know about something, the less scary it seems! Dental cleanings involve removing plaque (soft, sticky, bacteria infested film) and tartar (calculus) deposits that have built up on the teeth over time. Your teeth are continually soaked in saliva which contains calcium and other substances which help strengthen and protect the teeth.